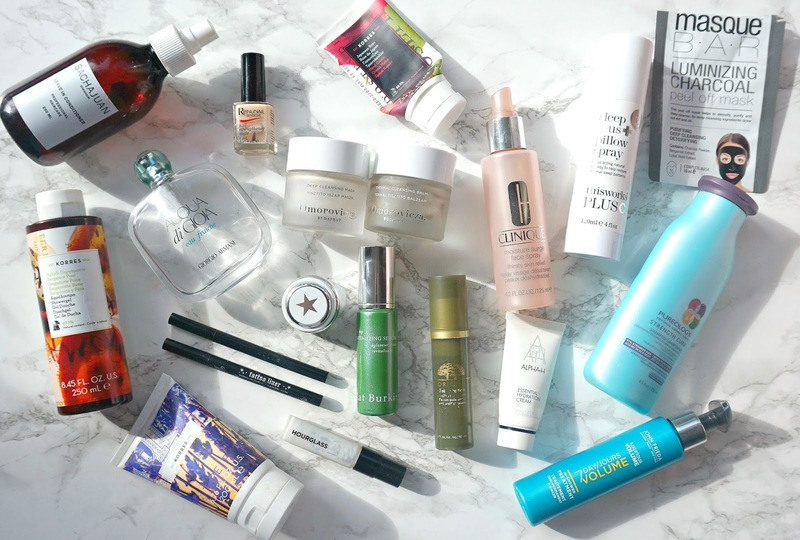 I'm back with another empties post and, as usual, I have a lot of skincare products! I am really focused on using up lots of products that have been open for a while before opening new ones and I'm happy with my progress, which is pretty evident from the photo above! Omorovicza Deep Cleansing Mask: A really brilliant mask for deep cleaning the skin, without being at all harsh or leaving the skin feeling stripped or tight. Suitable for all skin types. I loved using this mask and the only reason that I won't repurchase immediately is because I adore the Ultramoor Mud Mask from the same brand, which also deeply cleanses the skin but with the added benefit of lifting and firming the skin. Omorovicza Thermal Cleansing Balm: The product that started my love affair with Omorovicza! I adore this cleansing balm - it is so gentle on the skin, it breaks down every last bit of makeup without stinging my eyes, gives a really deep cleanse and leaves my skin feeling soft, smooth and hydrated. I can't sing its praises enough and it is a product that will be forever repurchased (this is probably my 6th jar). I have around 6/7 cleansers on the go so won't repurchase immediately but I will in the near future because my skin LOVES this cleanser. GlamGlow SuperMud: This mini pot came in a set that I bought last year and is the second one that I have finished. This is far too harsh as an overall mask for my skin but I use it as a targeted treatment if I feel a spot coming on because it does work at decongesting the pores and calming spots. If I see another set with my GlamGlow mask of choice in it (ThirstyMud) that also contains this, I will repurchase but otherwise, probably not. Masque Bar Luminizing Charcoal Masque: This was sent to me but I have no idea who sent it as there was no compliments slip or card in the envelope. I actually really liked this peel off mask - it deeply cleansed my skin and left it looking very clear and bright. I love the satisfaction of using a peel off mask - as long as I don't catch it in my eyebrows on my hairline - that's when it becomes painful! I may repurchase occasionally in the future. Kat Burki Rose Hip Revitalizing Serum: One of the most expensive serums I have ever used but not one that I would repurchase. I've come to the conclusion that I absolutely hate the scent of Rose Hip Oil, so although I loved the texture of this serum and how it calmed my skin during periods of inflammation, I couldn't wait to finish it! Origins Plantscription Anti-Ageing power Serum: I really loved this serum. I bought it after using a deluxe sample that came in a gift set - I love when brands give deluxe samples so I can actually decide if it is doing something for my skin. This serum really nourishes and plumps the skin, whilst also soothing it and leaves it feeling very comfortable. It is one that I will repurchase in the future. I love the Plantscription line in general. Clinique Moisture Surge Face Spray: I absolutely love this face spray because it actually adds some moisture to my skin. I use this after my acid toner and before applying serum/eye cream and moisturiser. It really quenches my skin's thirst and I also love to spray it during the day during the summer but also in winter when my skin feels the effects of the central heating. I already have a back up of this that I received for Christmas. If you have dry skin, you need this in your life! Alpha-H Essential Hydration Cream: My lovely friend, Dorota from BeautyDramaQueen, gave me an Alpha-H set for Christmas and I fell in love with this cream. It is perfect for dry, inflamed, sensitive skin - so much so, I have already purchased a full size. Korres Lavender Blossom Body Milk: Regular readers will know how much I love Korres products because they are high quality without the high end price tag. I adore the refreshing scent of this body milk and it is really moisturising without being greasy. I will repurchase at some point but right now I have another scent on the go. Korres Bergamot Pear Shower Gel: I love this scent combination and this shower gel foams nicely but doesn't dry my skin out at all. I really love Korres shower gels and I luckily already have a back up of this one. Korres Japanese Rose Hand Cream: Another beautiful Korres product. This hand cream is really moisturising but absorbs quickly and the beautiful rose scent is very calming. I love how nourishing Korres hand creams are and they are relatively inexpensive. I have 3 other hand creams on the go at the moment but will definitely repurchase in the future. Pureology Strength Cure Shampoo: This shampoo is really brilliant if you have damaged and dry hair. It leaves the hair feeling very smooth and soft and whilst it doesn't weigh it down, it does feel like there is a bit of build up when used consistently so I liked to use different shampoos in between uses. My only problem with it (apart from the price) is that my hair became a little greasy at the roots more quickly than with other shampoos but I think that might not be an issue for those with thicker hair. I have a few other shampoos on the go at the moment but may repurchase in the future. John Frieda Luxurious Volume 7 Day In Shower Treatment: This treatment really impressed me - the entire John Frieda Luxurious Volume range did actually. This is applied after shampooing and conditioning and then left for around 5 minutes before rinsing and it made a noticeable difference to the volume in my hair. It also made me hair feel very soft and look swishy (you know what I mean, right?!). Right now, I am happy with my hair products but I probably will repurchase this at some point in the future. Sachajuan Leave In Conditioner: This is just a bit "meh" - definitely not worth the price. I have used other much less expensive leave in conditioners that worked much better than this one. It had been hanging around in my basket for ages so I am glad that I finally finished it but I definitely won't repurchase and wouldn't recommend it to anybody with dry hair. Kat Von D Tattoo Liner: I really like this liner and it is the second one that I have finished. It doesn't smudge, which is no mean feat on my oily eyelid/watery eyes combination. The only con is that whilst it is very black initially, I notice that the black fades as time goes on (not throughout the day but as the liquid nears its end). That being said, I have already purchased a back up. Stila Stay All Day Waterproof Liquid Liner: My all time favourite liquid liner. This is a really opaque black and will not budge but is easy to remove withing any tugging on the eye area. I have used up several of these and it will be forever repurchased. Hourglass Veil Mineral Primer: I didn't think that this primer would suit my skin but I was entirely wrong and I fell in love with it. A small amount smoothed my skin, blurred my pores and fine lines and created the perfect canvas for my foundation. I used very sparingly because I didn't want to run out but I loved it so much that I purchased the full size. Armani Acqua Di Gioia: This minty, lightly floral and citrus scent is so uplifting and refreshing and, to me, is Spring in a bottle. I absolutely love it and am sad to have finished this bottle because I can't justify a repurchase at the moment as I have so many perfumes but I will definitely buy it again in the future (or drop heavy hints at birthday time!). Dr Lewinn's Renunail Nail Strengthener: This is the second bottle of this that I have used and I really love it because it has strengthened my nails like no previous product I have tried but I can't seem to find it online at all so I hope it hasn't been discontinued. I will repurchase if I can find it but if not, would love your nail strengthener recommendations. This Works Sleep Plus Pillow Spray: This is a lifesaver for me - it not only helps me to get to sleep but also helps me to sleep right through the night. I used to wake every night but it rarely happens when I use this. The calming scent is perfect for when I am winding down and I recommend it to anybody who has sleep issues. I prefer it to the original This Works Pillow Spray and I already have a back up. If you have made it this far - well done & thank you! Do you like empties posts? What have you finished up recently? I would love to hear in the comments below! All products are bought by me, unless otherwise stated.All three of the Korres products were sent to me, as was the John Frieda Volume Treatment, as pr samples Opinion is always my own.